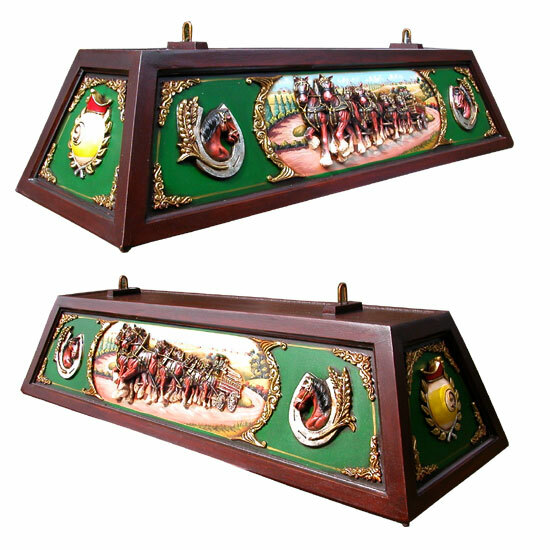 This hand painted pool table light diffuser features 3-D Clydesdales and more in incredible hand painted detail. This resin/wood combination pool table light fixture is one of the most popular game room accessories of all time. *Bulbs and electrical wiring are not included and are readily available at your local home supply center. We recommend compact fluorescent bulbs. In addition to great energy savings they produce the cleanest bright light without casting blotchy shadows on your cloth as standard incandescent bulbs do. Can be either hard wired or made to work with a plug and inline on/off switch.